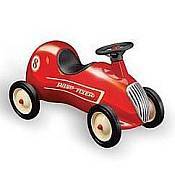 The Radio Flyer® Little Red Roadster has a very cool retro look and is made of all steel body painted a shiny red . Also has a working steering wheel and honking horn. The seat is a non-slip seat that will keep your lttle one in place while behind the wheel. 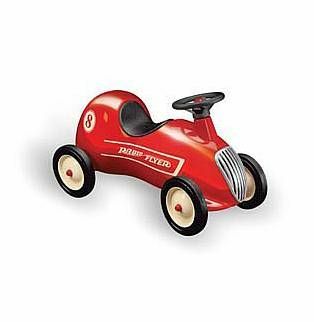 This foot to floor car will keep your little one busy practicing his driving techniques. Made with steel wheels and all rubber tires. Body: 26 1/2" x 9 1/2" x 11"
Wheels: 6" x 1 1/4"